TO SHOP FOR PRODUCTS USE BUTTONS BELOW OR MENU AT LEFT. 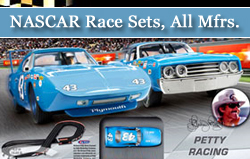 All sets are 1/32 scale unless otherwise noted. 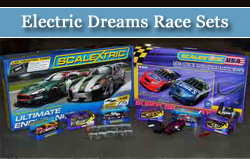 Purchasing a race set is the first step in getting started in slot car racing. 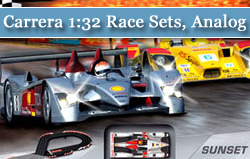 All the race sets we sell come with everything you need to begin - cars, track, controllers, and power supply. Some include accessories such as overpass supports and borders for some or all of the corners. 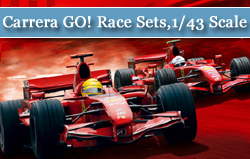 With most sets you can be racing within half an hour of opening the box. Track sections simply snap together (with the exception of Carrera track which uses separate clips underneath the track to hold the sections together) and all the electrical components plug together. We won't try to tell you that the instruction sheets are as comprehensive as we wish they were, but they do give you enough written and pictorial information to get you started successfully. 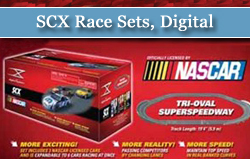 If you are fairly confident right from the start that you will be going on from that first race set to a larger layout and a long-term hobby you will do well to start with the largest set your budget will comfortably handle, since track and other components are less expensive as parts of a set than as separate purchases. If you are not so sure that you (or the person you are buying the set for) will stick with it then start with a smaller, less expensive set to test the waters. You can always add to it later. When choosing a race set for young children you should keep in mind that crashing will not only be inevitable until your kids develop the coordination, attention span, and self-discipline for serious racing, it will be a big part of the fun. So, itâ€™s always a good idea to look for a set with cars that are sturdy, with no delicate parts to break off. You also want cars with lots of cornering grip so they will be easy to drive with only a little practice and experience. Kids enjoy crashing but they get frustrated and lose interest when they canâ€™t complete a lap without crashing even when they want to. 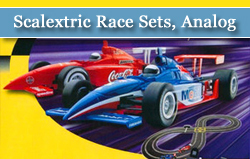 If the whole family will be using the race set you may want to go ahead and get Dad that Formula One set he lusts after, but F1 cars are not the best for children or even for adults until they develop some skill, so also get a pair of inexpensive, rugged cars Like the Scalextric Porsche Boxster and Audi TT for everybody to learn on and the kids to have their crashfests with. Otherwise, Dadâ€™s F1 cars will be in ruins in no time. 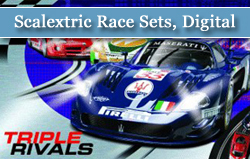 Remember that when you are choosing that first race set you are choosing a track system from which to build the larger layouts to come, so you want to look well beyond the initial purchase in making your selection. You will need to take into account factors such as space availability, layout options, availability of compatable accessories, and suitability for your particular situation, such as the need to set the layout up and take it down frequently or whether it will be played with by small children. 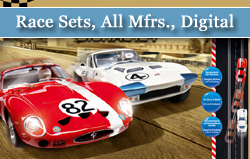 Our web site offers information about the various track systems. 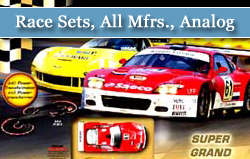 Look for it in this section and in Track and Accessories under the manufacturers' names.